Pick up fishing hooks, lines and sinkers ..even if they're not yours! Save a life! Walt found his way to the pond in March of 2018. 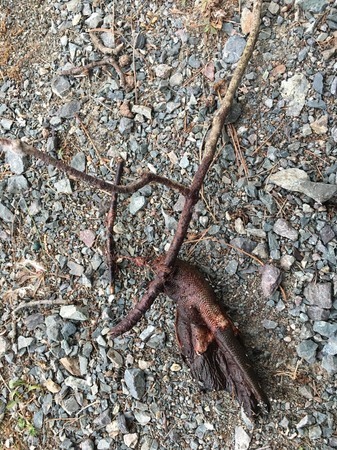 He was missing a foot, but then I noticed something I had never seen before; the severed foot was attached to a twig, which was in turn, attached to his other leg (with the good foot). All this was attached via fishing line, which did all the damage. I knew he was new to the pond, since this type of situation must have taken a long time to develop. We certainly would have seen it if he had showed up before. After exercising tons of patience, I jumped on the opportunity to capture him. I knew the severed foot could not be saved, but the line was wrapped around the other leg and in time, would sever that foot as well. I proceeded to cut the line from his leg and then another first occurred; blood began shooting everywhere. It was so bad I thought he could bleed to death. We have cut fishing line from many geese over the years, but this never happened before. I elevated his leg and applied pressure above the source, attempting to stop the bleeding. I used the sweatshirt I was wearing as a bandage. No help was on the way, as my wife, Misse was working late and I could not access my phone, fearful he would get away and bleed out. I held him there in my arms for over an hour, praying the bleeding would stop. There was me and Walt (though I hadn’t named him that yet), kneeling on the ground together, as darkness settled in. He did not fuss or fight, knowing he was getting much-needed help (they are so smart). By the grace of God, the bleeding stopped. I held him a little longer with no pressure applied to the wound, making sure the bleeding had indeed stopped. I then released him into the pond. He flew in with a group, but they departed at darkness, while I was still holding him. I feared it was his family and felt awful, but I know he would certainly have lost the other foot or bled out if I let him go. I cannot imagine the pain he was in (and all of them that lose legs and feet to fishing line). Add that he was flying and living with the severed foot still attached away from his body via the twig with fishing line, makes this an unprecedented situation. 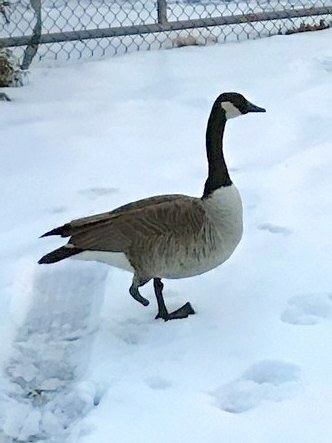 To this day, Walt is a regular visitor to the pond (has been since that day) and has made many friends amongst our flock. He comes up to us for corn, surely remembering my face. He is one tough being. I know no humans who could have endured the pain and anguish he certainly went through. He can actually walk, using the stump of his right leg as a foot. From a distance, it just looks like he is limping. It is so remarkable how they adapt and move forward. We’ve seen so many stories of that over the years. They (our Canada Geese) continue to awe & inspire. I have enclosed some pictures of him and the foot he lost, so you can accurately see what I described. God bless Walt, and all the wonderful creatures on this earth.